The rumors were true! 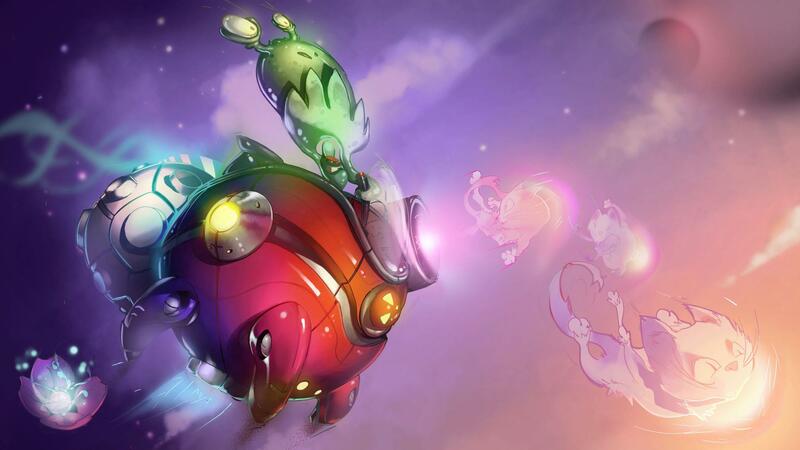 Ronimo Games has confirmed Coco Nebulon and Derpl Zork as their upcoming DLC characters for their 2D multiplayer online battle arena game, Awesomenauts. Not only that, but both of their skill sets have been unveiled. The DLC will be arriving in tandem with the patch, the latter of which is still on its way to certification. Patch 1.1 includes fixes to the much-awaited network updates as well as a cornucopia of changes to the existing Awesomenauts. We won’t go into the changes in detail (as there are a lot of them), but you can find them here. Suffice to say, Voltar and Leon have gone through some reworking. As for the new characters, Coco, a hoverboard ridin’, cosmic waveblazin’ gal from Okeanos is described as a support character. Her Blaze ability allows her to leave a trail behind her as she moves, which likely will slow or damage enemies chasing her and her team mates. Ball Lightning, her other ability, shoots out a ball of lightning (surprised?) which can be detonated at any time with a subsequent press of the button. Derpl Zork, a dreadfully unintelligent slug with a mech walker, is listed as a tank, which makes sense considering he’s in a robot suit. Derpl can deploy into a stationary siege mode where his snare trap (his other ability) then becomes a high damage nuke. When in siege mode, his cat launcher (yes, his basic attack launches cats) becomes a gatling gun; cats everywhere hiss in disapproval. It’s great to see the developer following through on their promise to balance and update the main game while providing more characters for those interested. We’ve reached out to Ronimo regarding these patch notes to see what they have to say about the changes to the existing characters. And yes, we will be providing a guide for the DLC characters, and updating our current one to match new builds.